Upon opening the box were are given a HUGE amount of parts all individually wrapped. 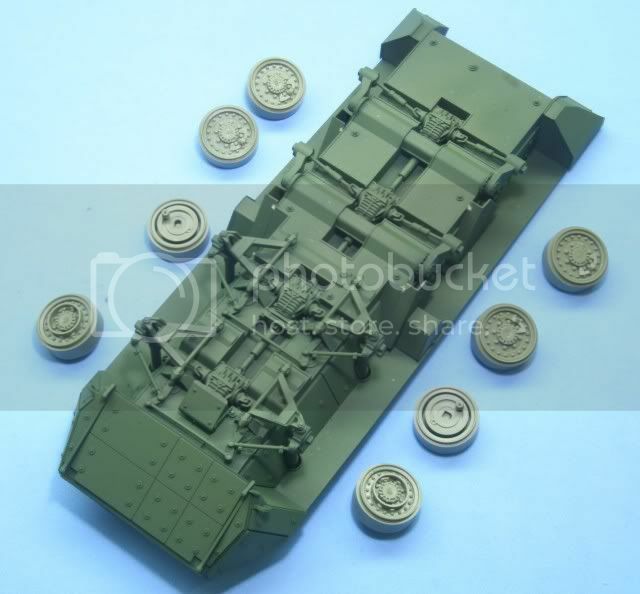 There is a total of 14 sprues (one clear), upper and lower hull all in styrene. 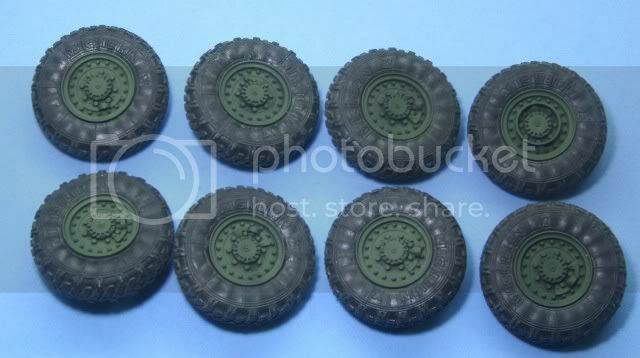 Also are rubber tires, metal turned scale 105mm barrel with rifling, a small PE sheet, decals and instructions. Upon examination of the hull sections and about half the sprues through this updated, the quality of the kit is amazing. As an engineer I appreciate well designed things. Everything on this kit appears to be well thought out. There are no voids or sink marks in any of the parts. 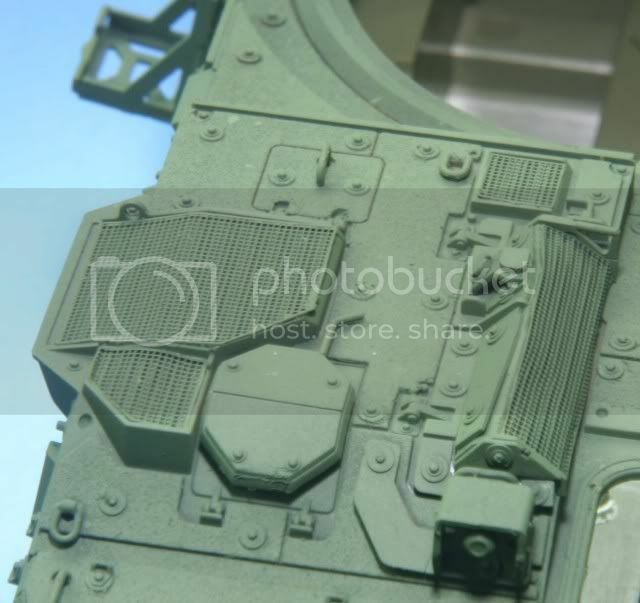 The injector pin marks are light but thought out so they only appear on sides which do not show on the model. The fit of the parts is near perfect. A test fit of the hull sections leads me to believe no filling or sanding will be required. 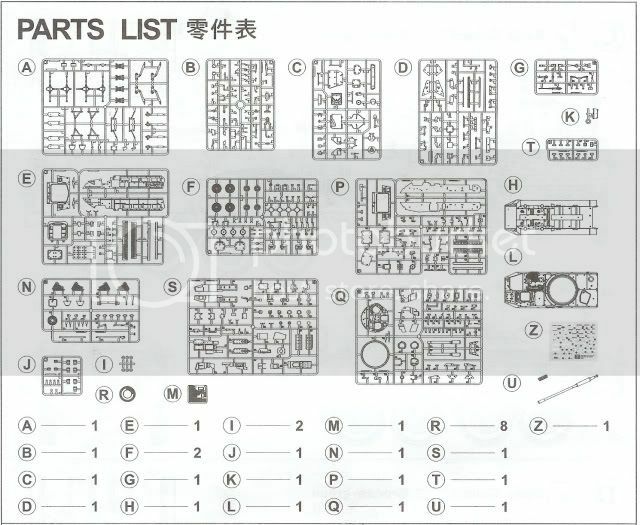 The kit is quite extensive and detailed and the instructions contain 42 steps to building this kit. 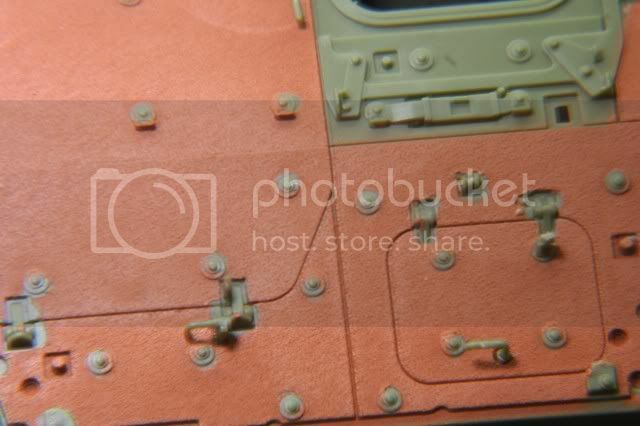 The good part at least up through this update is the parts fit so well and clean up from the sprue so easy that the first four steps to assemble the lower front plates and the drive train went easy and quickly. All comments are welcome, thanks for looking. "The Moral High Ground....A Great Place to Emplace Artillery." Off to another great start Mike. Jeeze, I wish that they'd come out with the mortar carrier (not that I could get it completed any time soon anyway). Are you going to base this off a particular photo as per your MO, or just going with your gut and with what's in the box (WITB)? i have been want this kit for a while now. i have seen serveal great builds on it and the more i see it the more i want it. redlleg are you going to put the slat armor on it? Mike you are gonna need a BIG box to carry all this stuff to AMPS next year. I'll be following this as usual. Looking great so far Mike. Keep us posted. YES! I've been waiting for a WIP! 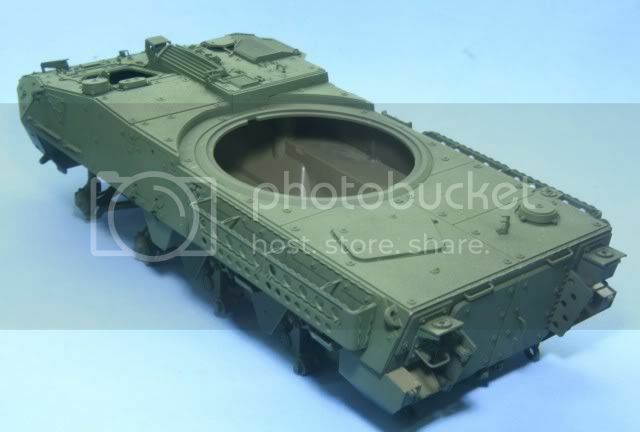 Are you going to try to depict a deployed vehicle with the modded slat armor? I'll be watching this with great interest! There are not many photos of the M1128...this was one of the better ones. 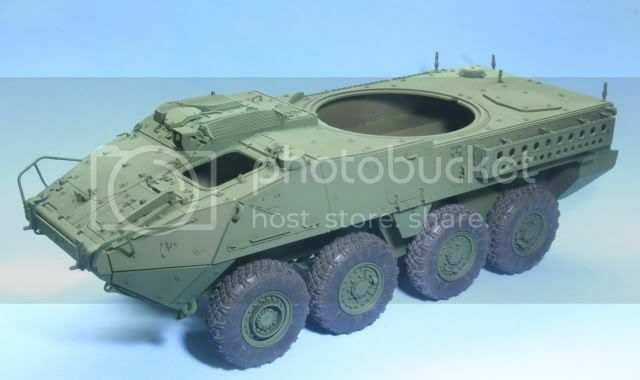 Have no fear, I'm sure the mortar carrier M1129 will be coming soon. Heavy - It's always a pleasure to have you drop by. I'm sure you will keep me honest on this one. Thanks for any help in advance. Beav - Slat armor....no, for a number of reasons. 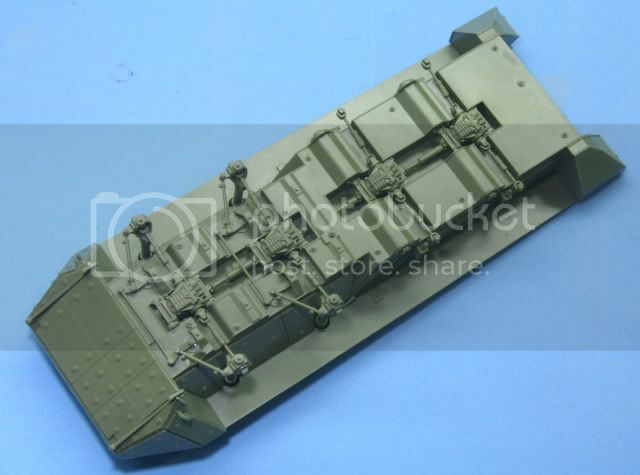 One, the slat armor used on the M1128 is different than what is used on the M1126 and M1130. The AM kits out there are for those vehicles. 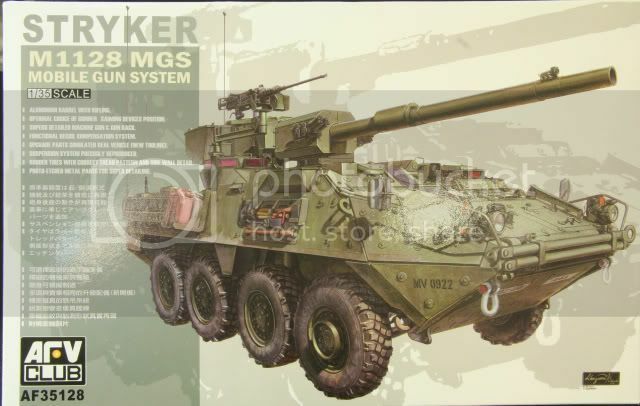 I am sure than can be modified, but....I think this Stryker will be a training version. Also the slat armor is almost a build in itself....frankly, I'm not in the mood right now to bend and assmble that much metal. Lastly, this is a unique Stryker. I would like it to stand out for itself than have all that metal to catch your eye. So with that....the answer is no. There are a bunch of interesting things to do without it. thanks for looking. As with all your projects Mike, I will be following along with interest to see what you do with this one. Keep us posted on your progress! Just checkin' with ya Mike. Ya had me wonderin' there for a few. Will you be including that drip pan too? Kinda looks like standard issue. From: beacon falls , Ct.
Kevin - The smell of styrene cement is good for the soul. Glad to see you come back to church. Tread - My man.....Run Silent Run Deep....always welcome to put up your periscope here. Very cool build. I just love the way that the MGS styker looks. I want one and now I am going to watch your build. I to would love to build one based on a photo. Do you know or can point me to pictures of them? Moose - Thanks for looking. There are not that many pics of the M1128. Prime Portal does not have anything yet. This is one of a few photos I picked up by searching the internet. After a base coat of Tamiya Flat Black and a first coat of Tamiya NATO Green on the lower section and remaining parts, I then completed the assembly of the lower chassis. Also assembled the wheel hubs and they are ready for paint. To this point I am done with the first nine steps in the instructions with the exception of mounting the tires and wheels which will wait until after final painting. Next the instructions move to the upper hull. 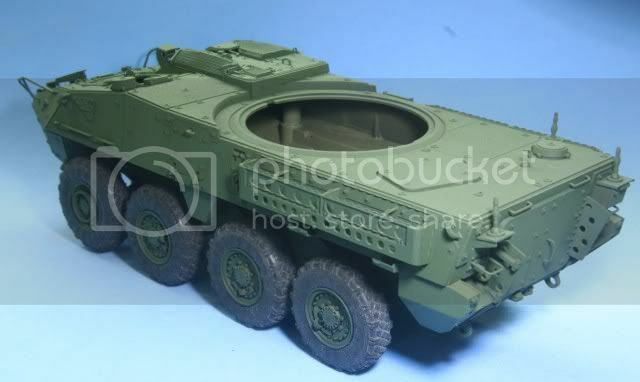 The M1128 like all Strykers has a non-slip coating on the top flat surfaces. Before I do any assembly I masked the upper hull and some hull parts to be coated with Rust-o-leum Terra Cotta surface paint to give the non-slip effect. Masking all the bolt heads was a chore, punching dots with a Waldron punch. After the coating and the masking removed, here is what it looked like. The next 3 steps in the instruction call for the assembly of the side panels. The tools were left out of the tool rack until after painting. The next 3 steps include mounting the side panels and some other panels including all of the loose parts coated above. Here is where I will stop for now. The next few step are mounting a lot of detail parts on the upper hull. While I'm sure it was tedious, looks like your efforts paid off Mike with the Rust-o-leum solution. Bill - Thanks. I'm sure 3M never invisioned there tape being used in this way. Over 60 bolts took awhile but I'm happy with the way it turned out. The rust-o-leum paint gives a nice textured finish. This is a wicked-cool-looking vehicle! I was half-thinking of adding it to the stash, but reality intervened! I'll be watching what you can do with it! G - As always a pleasure to have you drop by. Thanks. I also took a look at your album, they all look great. How many of the builds are of vehicles that you have personal experience with? Padakr - Thanks for looking....at everything. I commanded a battery of M102 howitzers....with M35A2 prime movers. The Hummer was my command vehicle..B6. When we first recieved them we were short rear covers so thats why the strange rear cover. The M107 was where I started and served on. well done thier redleg. thats why i asked about the slat armor i seen that on the other site. and as for those grab handels thier a royal pain in the !!! As for the slat armor, the M1128 uses a different slat armor than the M1126 AFV or M1130 Command AFV. 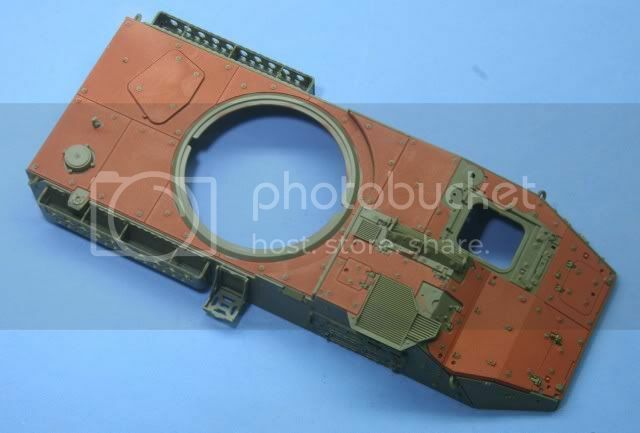 The slat armor kits out there are not correct and will not work with the M1128....so I am save from slat armor hell. 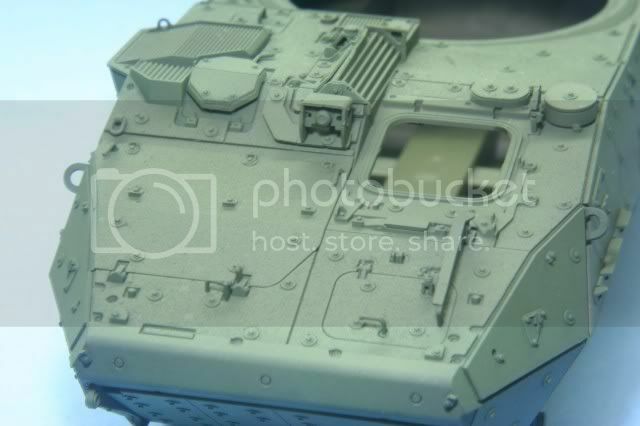 In the future when I do a M1126, I will do it with slat armor. This kit will look cool without it. 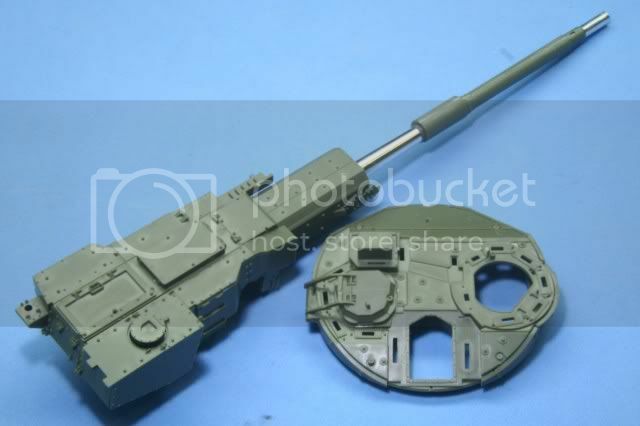 all right here is a little tip for everyone that is working on a stryker or a mgs. for the grab handles DO NOT USE YOUR KNIFE OR SCRIOSS. ues a razor blade. thats how i got all mine off the spru with out them braking. i am all most thru with mine. yahoo. For those of you who wanted to see the anti-slip coating up close, here is a detail shot. While I waited for glue to dry I finished the drives hatch except for the armor glass, a whole step in itself with all the small parts and also finished the rear section except the antennas which was another two steps. The grab handles over the lights and for the rear door handle were broken on the sprue so I replaced them with 22 gauge wire. 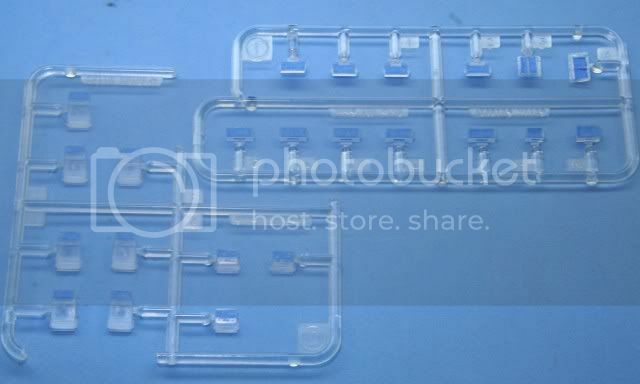 The kit is well built but has a number of very small and delicate parts which make this kit not for the faint of heart. Before we start up the spray booth I completed the first 3 steps for the main gun. 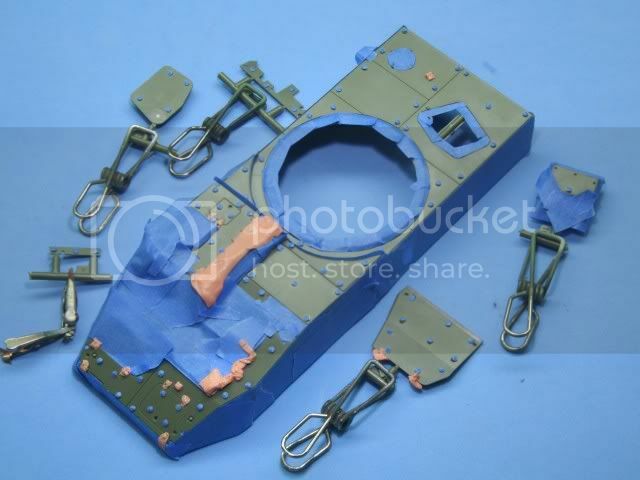 Again the fit of the parts are good but AFV defeated the purpose of a metal barrel by having two wrap around halves for the bore evacuator and details. The seam is minimal but will have to be dealt with. I continued on the gun through another 3 steps and what remains is the last two steps which are mostly grab handles, straps and smoke launchers. 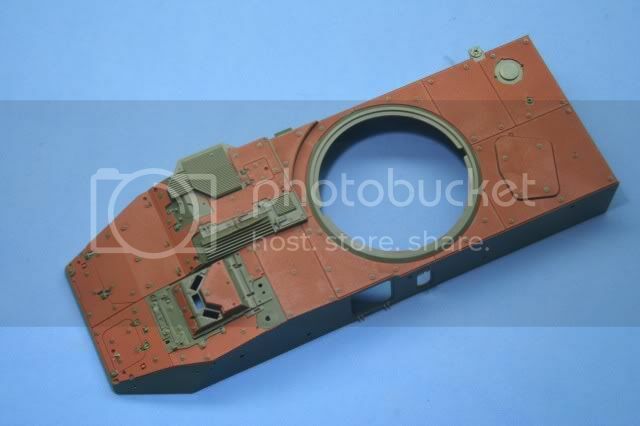 Also missing is the gun sight system which has armor glass front. I also moved through the first 3 steps of the turret assembly, again except for armor glass. I moved to the spray booth and base coated the upper hull and rear section with Tamiya Flat Black and then put on a coat of Tamiya NATO Green. Once the paint was dry I assembled the upper, lower and rear sections. First I glued the rear section to the lower hull. 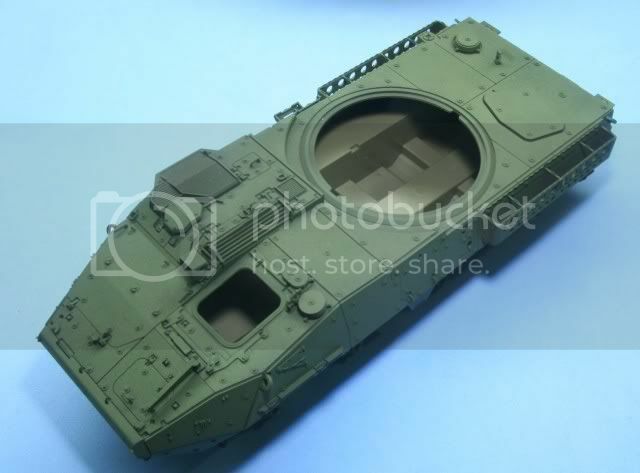 Once that set up I assembled the upper and lower hull. The assembly takes time to line up but once in the proper position, the sections snap together nicely. The fit is almost perfect except a slight gap between the upper hull and rear section. I closed this up with a little MR Surfacer and touched up. For those wondering what the anti-slip looks like painted, here is a close shot to give you a better view. 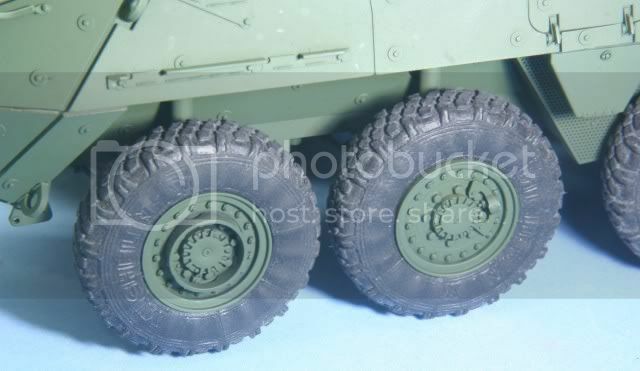 In between these major items, I painted the wheel hubs, removing the right side front wheel cage as it was pointed out to me that the actual M1128 only has one cage (as opposed to what the directions tell you) on the left side. Also painted the light assemblies and chromed the inside part of the lights along with a few other minor tasks. That's it for now. Lots of little details still left, the biggest of which is painting all the armor glass. Even with my jumping around, this represents about 75% complete, based on instruction steps. So far the kit is outstanding. The only drawbacks so far is the split barrel cover, a few broken small parts (mostly hand holds), and a few mistakes on part numbers in the directions. All of this is minor thus far compared to the overall kit quality. Amen to that. I have been very fortunate that none of the pieces have been broken on mine (well, except for the ones I have broken myself). I have to say, it is looking very nice. I am looking forward to seeing the completed build. Are you going to build a diorama for it? Now I'll have to go take some more pictures of my progress (not as far). I'm not a dio builder but it will have a base with terrian. I have the Real Models Molle kit for packs. Also add some more water cans, and some MREs. Will also try to add a driver and TC. I have the Verlinden kit for those. Next I painted some clear decal paper with Tamiya Clear Green and also a mix of Tamiya Clear Blue and Red to make the Clear Magenta. Then I spent time with the digital caliper measuring and cutting and then mounting. 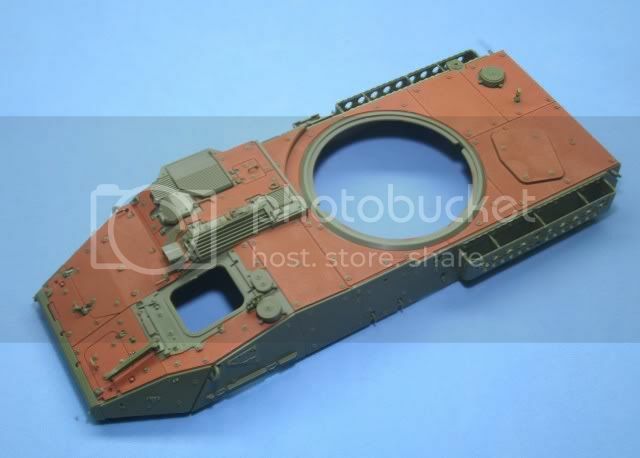 To finish the turret I mounted the TC hatch, gunners hatch and sight, miscellaneous handles and the gun travel lock....which was a true PIA. 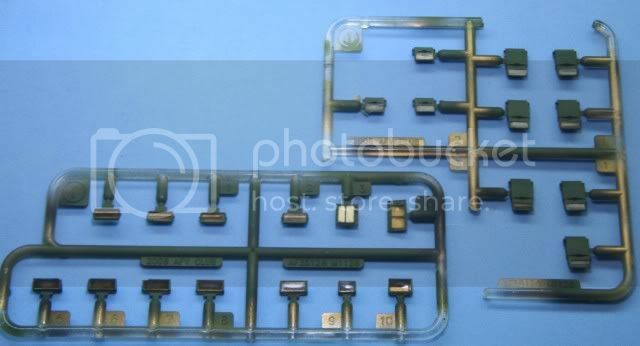 Without going on a rant, there are some parts which are so small on this kit, and there is no reason not to have molded them on the main assembly. Some of these appear to be parts for parts count sake. The side pars on the TC armor glass is an example. Others could make life better if done different. The travel lock is one of them. It is the one major drawback of the kit and does use up a lot of time to work with them correctly. 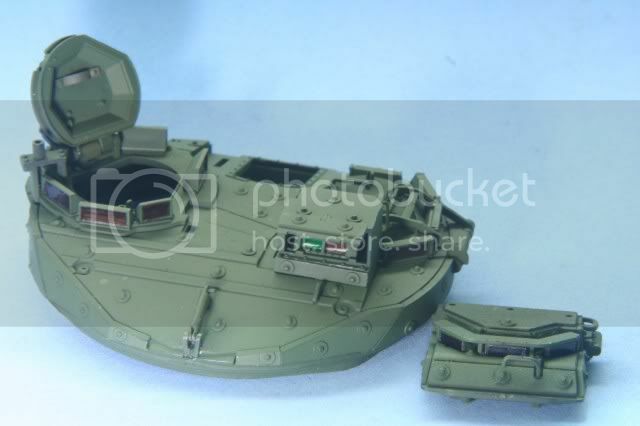 Back on the build, you see the assembled and base coated turret and drivers hatch. Moving back to the main vehicle, the tires were nice and shiny rubber. To get them more the "used" look, I rubbed them down with a Scotch-Brite pad and then assembled them onto the rims. With the tires assembled, I glued them in place on the chassis. Also I assembled the PE screens onto the vents, mounted the front guards, drilled the antenna mounts for an antenna, mounted the antenna mounts and the last few grab handles. After a final basecoat of Tamiya NATO green here is where I am. Close up view of the PE screens. These went on pretty easy but do require care. Close up of the tire assembly. The drive side front is the only tire with the ring. The directions incorrectly tell you to put it on both sides. That's it for now. I am working on the front and rear lights, mounting the drivers hatch, tow hooks, pioneer tools, some detail painting on the chassis and remaining PE straps for the chassis. Hopefully I will finish up the chassis this week leaving just the gun section to finish. This also answers a question I had about the color of the periscopes...I wasnt sure if they were to be white, black, or some other color. I need to check my wheels, too, as I'm sure I glued those rings onto every wheel. I find it amusing that we both posted our Stryker construction updates within about ten minutes of each other. Cameraflage - Thanks for looking...yep I was commenting on yours while you on mine. Be careful, there is only one ring on the M1128. Some of the other models differ. Look at some pics to make sure. As for the glass, I found it easy to leave the glass color for last. Hope it helps. Thanks for looking and for your comments.